The production of Olympic Gold Medal stamps seems to have gone smoothly apart from the problems at Preston which prevented them from printing the last three stamps. There are minor variations in colour/shade and some stamps look grainier than others, but overall things seem to have gone to plan for Royal Mail and the army of printers and couriers. So this sheet is something of a surprise. Bought at a Post Office branch, it shows an upward shift of the digital overprint by approximately 6mm. This results in the athlete image overlaying the perforations, and the caption being printed over the preprinted gold text. Only one miniature sheet has so far been reported. UPDATE: Well, that didn't last long. Our anonymous contributor in the comment below has forwarded an image of a complete A4 sheet, with an even greater shift - about 9.5mm. And being a complete sheet, it shows that the printer was in Preston. 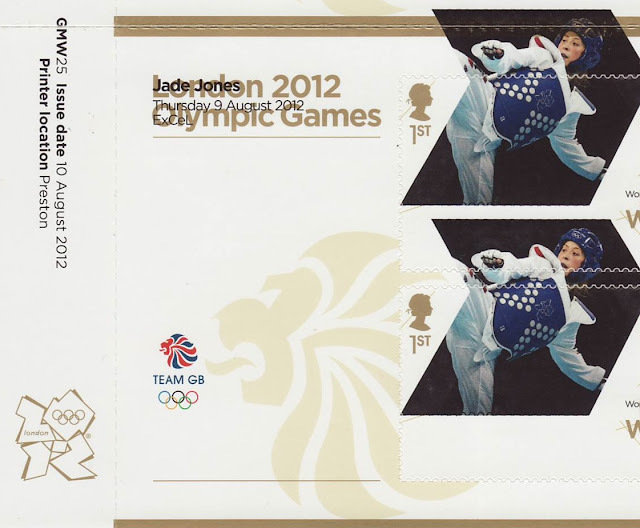 Here's the lower left corner: And from this even more than the other, it is evident that the Team GB logo is printed at the same time as the athlete image, by the digital printer. We understand that the regional printers were selected after several trials and tests, over a 6-month period. The test sheets (call them proofs if you like but they weren't actually proofs of the finished GM stamps) were examined by Royal Mail before the six printers were actually selected. The Taekwondo medal was won around 10.35pm, the artwork reached the printers at around 11:45pm, the plates were on press about 1am, with guillotining around 3am. If these misprinted sheets were the result of the set-up (or make-ready) process, and were put into the pile of 'good' sheets in error, then that is when it happened. The Postmaster at Flint confirmed that he started selling the stamps at midday on the day of release, and within a couple of minutes had received a call from royal mail advising him to stop selling the stamps until he had checked them all. Apparently he had ‘several’ in his safe to return to Royal Mail. Wow, just a top sheet so far, shame it wasn’t the bottom one as that would have shown which location printed it. This was GMW25, could errors of this nature have caused Preston to cease printing at GMW26? A shift like this given the method of printing would I guess have affected the whole printed sheet the same. I remember seeing a Royal Mail senior member of staff holding a test sheet with the bike design on, that suggested that the sheets going though the printing press held two A4 sheets across and two down and were thus larger than A2. Does that mean there are at least another 15 miniature sheets out there with this shift? Given the mad scrabble for the sheets that occurred at my Post Office on the day of release there are many A4 sheets that have been split in to miniature sheets stacked with the other stamps issued that day and slipped in to the Royal Mail storage envelope, some I expect are already been slip in to sock drawers for safe keeping. and the Team GB Lion and the Rings also moves off of the base line bottom left. 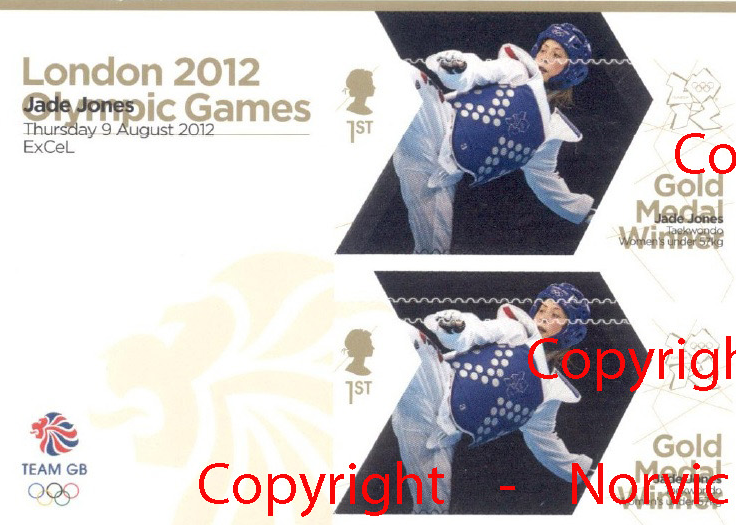 Also as the image spreads over the area between the stamps visually the dark chevrons with the image of Jade Jones appear unchanged but I expect would become rather obviously incorrect if single stamps were removed from the sheet; she will literally lose her head. This is a great blog, thanks. Thanks for your thoughts on this. I too wondered if it was Preston, but their problem was with platemaking, not colour registration. I believe the press sheets are B2 before trimming that is - as you say - 4 x A4 sheets so 16 miniature sheets or 96 stamps in total. Some, of course, might have been caught by quality control checks. Thank you, friend, for pointing out something that had not occurred to me before! I had assumed that ALL the common detail on the base sheets would be printed by Walsall, but as you so rightly point out, the Team GB logo on the stamps, and at the top left in the sheet margin, are printed by the digital overprinter. This is confirmed by looking at the Royal Mail video and seeing the pre-printed sheets loaded onto the digital printer's press - no colour there apart from gold and the beige lion in the background. This is probably so that Walsall didn't have to use the full range of colours. Thanks Chris. I didn't spot it - do you have the eBay number? "....Contrary to most stamps, which are gravure printed, the Gold Medal stamps have all been printed using B2 sheetfed litho presses on pre-printed base stock. "Because of the nature of stamps, with things like the Royal Mail's security elements, we had to make sure we could control production quite tightly," said Fry. "So we used pre-printed base sheets that contained everything except the image and text of the winning athlete and these were then overprinted in four-colour process with a spot sealer. The metallics and special colours were all on the base sheets." Ian, I fear that you fell into the very trap that I did - they are NOT overprinted digitally, but lithographically (or four colour process as Martin Fry notes). I am sure that I had read that digital (over)printing presses would be used, or maybe I had simply assumed it! Note also that Martin states that the design was complete (including special colours) missing only the black text and photograph. So could it be that the BASE sheet was misprinted / mis-diecut at Walsall and that the overprint by the secret printer is effectively in the correct place based on how the sheets would feed through the press? Thanks for your comment. We know that security printing is a tightly run ship as far as quantity is concerned. However, some of the shade variations between printers are quite startling. I'll scan and post later, but for example the London printer's Velodrome stamps have a much more orange track than the others. The first image, at least, was bought over the PO counter, so not a make-ready - unless you think somebody slipped some make-readies in with the 'good' stuff in error?? Ian - without asking for trade secrets or anything - how do you go about assessing rarity or value in such cases? I suppose, at this stage, it's educated guesswork, as much will depend on how many such examples are found. Given how strict the process appears to have been, my guess is that there will a very limited number of such errors, and, on that basis, £209 for the eBay item is on the cheap side. What do you think? The market will find its own level. If somebody offered me a sheet today they would expect to get around £200 for it (taking into account that the eBay seller would have had ebay/paypal deductions). If a lot more were found then that price might be too high. Although our Anonymous printer writes about colour calibration I think he will be surprised when he sees my scans comparing the products of the six printers! But that will be for later. Presumably printed in Litho, not Gravure? Some comments have been deleted at the request of the poster, who was in a difficult position having written about the actual printing process. Note that another displacement has turned up on Ebay today. This time the Chris Hoy stamp. The displacement is not as large as the previous examples but is still obvious. The item number is 300770992353. The offer is only for singles so printer is unknown. Thanks Paul (and Chris who sent an email). I would think he has a few if he is breaking them into singles and at a fixed price. Can anyone clarify this techno-printing stuff for me?! From what I understand from previous postings, the base sheets were printed in and imported from France - therefore Cartor and Litho printing (as Cartor don't have Gravure capability). The Regional printers then added their bits by Litho also? (Not sure what digital printing means). So the whole minisheets are actually all Litho? Am I right? Have I misunderstood? Many thanks for any clarification. In a nutshell, you are right. The base sheets were said to be printed by Walsall in litho, but we know that they can't, so it had to be Cartor. Royal Mail said that there would be 'digital' overprinting, but what does that really mean? Nothing in printing terms - it could be laser, ink-jet, litho... I think 'Digital' from their point of view meant that the images would be transmitted digitally, plates would be made, and printed from. In fact, that's how a lot of printing is now done - if you want a leaflet printed you make it up as a pdf file and send it to the printer by email attachment. Actually the concepts of Litho printing is different.Our thought the main principle behind the working of Litho Digital Printers is the fact that oil and water never mix. This type of printing generally uses a flat working surface. Here, the flat surface area is coated with oil and water and the different types of oil-based ink draws the image, picture or the text and the damp area is fashioned such that it repels the oil-based inks. Any more on this or any other London 2012 varieties/ errors one year one. Just wanted to know if there are any other errors out there and how rare they are. Just click on 'Error' in the word list to the right. Not all are Olympic but there are some others there.